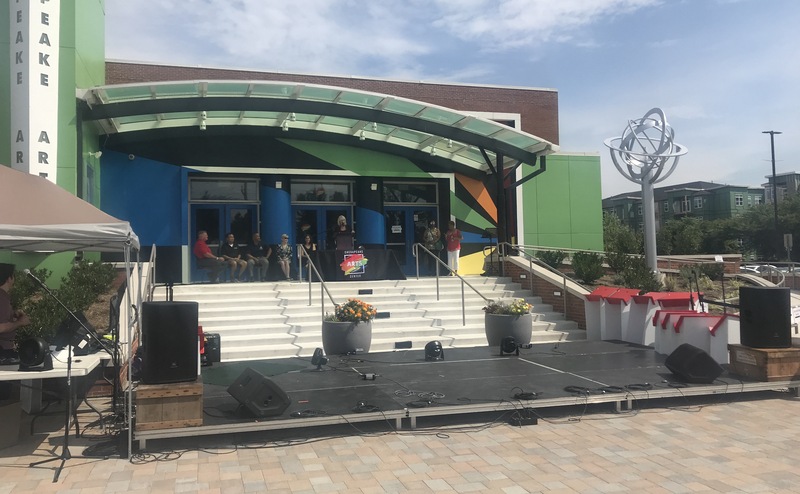 An armillary sphere created by Stephen Bradley, Ricky Siegert, and Charles Pennington was revealed to the public during the 5th annual Arts in the Park Festival. Chesapeake Arts Center (CAC) Resident Artist and UMBC Visual Arts Professor Stephen Bradley’s work spans many disciplines. His art explores our relationship to place through ambient sound recordings, landscape photography, and recorded stories juxtaposed with artifacts discarded or lost in the landscape. The location- the place- where his most recent artwork, Community Connection Sculpture, is installed reaffirms the importance and connection we have with certain locations and challenges us to consider how our relationships and interactions with a place can impact its- and our – future. As the center of community in Northern Anne Arundel County, the Chesapeake Arts Center serves to excite, educate, engage, inspire, and grow through performances, exhibitions, classes, and collaborations with artists, educators, business and community leaders, and organizations. Welcoming students of all ages through its doors every day, it is only fitting that this meeting, gathering, and growing space is now home to a large metal Armillary Sphere created by the artist with Ricky Siegert at Inferno Design and Charles Pennington. It stands at the entrance of the CAC, reminiscent of an artifact from the past, inspiring wonder and kindling ingenuity. Bradley shared some details about the artwork and what it represents for the community. Community Connection Sculpture – Honoring the Past, Embracing our Future. The public sculpture symbolizes an optimistic and innovative future created through the union of the arts and technology that serves the local community. Historically, CAC has been one of the few open spaces in the area for creative exploration. CAC offers ceramics, theatre, music, dance, painting and other related arts, including exhibitions and performances. Today, CAC offers its newest facility to community residents with the launch of a contemporary MakerSpace. Classes are available for those who seek to become certified in order to use computer-controlled tools — including those used for wood-working and light metal fabrication. Historical armillary spheres were originally used as a way to model celestial objects, such as the sun, stars, and planets. Instead of the earth occupying its center, however, this sculpture holds a hexagonal form with an array of LED lights. The sculpture’s nucleus represents the center of CAC’s creative offerings and illuminates the building’s facade with subtle shifts of shadow and light from within its local “universe.” Its rings demarcate local points: Baltimore City, Annapolis, Curtis Bay, Brooklyn Park, Linthicum, and other significant places in the surrounding communities that CAC serves. This contemporary version of the 2,000-year-old armillary pays homage to art and science endeavors of the past while inviting viewers to participate in a creative future dedicated to embracing arts and technology- one that values a STEAM-rich education, civic participation, and social entrepreneurial opportunities. The Chesapeake Arts Center (CAC) is an Arts Empowered Minds Initiative (AEMI) partner along with Young Audiences of Maryland, Anne Arundel County Public Schools (AACPS), Arts Education in Maryland Schools Alliance (AEMS), The Arts Council of Anne Arundel County, University of Maryland, Baltimore County (UMBC), and Creating Communities. In addition to his art and teaching commitments, Stephen Bradley serves as an AEMI Advisory Committee member.